Mirror Therapy trainer Jasmin Avdovic from Sarajevo, Bosnia and Herzegovina, presented a one hour Mirror Therapy workshop as part of the official program of The 1st International Physiotherapy Congress on 10/09/14 at Institute Dr.Simo Milosevic in Igalo, Montenegro. The Institute, one of the largest and the most famous institutions for multidisciplinary spa treatment on the Balkan peninsula, is a pioneer of modern physical and preventive medicine, rehabilitation, talasotherapy and wellness and a leading international rehabilitation center. 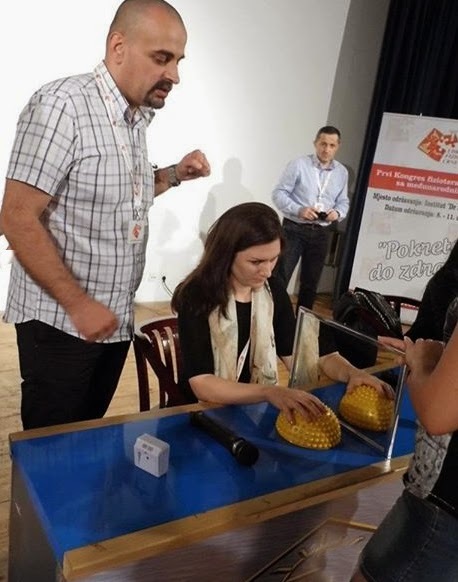 Over 120 Congress participants were introduced to the Mirror Therapy technique by Avdovic through interactive presentations and demonstrations that allowed participants to feel for themselves the basic principles of Mirror Therapy and body reactions to it. Besides the large number of health professionals attending this workshop, national physiotherapy associations and certain health institutions from Slovenia, Croatia, Bosnia and Herzegovina, Serbia, Montenegro, Macedonia, Kosovo, Albania, United Kingdom and others participated as official representatives of their national associations. Many representatives expressed interest in organizing full-day Mirror Therapy workshops. Mirror therapy in the Balkans is important because of the high number of limb amputations, primarily in Bosnia and Herzegovina, as land mine fields were the worst in world, followed by Croatia and Kosovo. Jasmin Avdovic also explored the importance of using Mirror therapy for stroke, aneurism, traumatic brain injuries and others neurological disorders and conditions) with the participants. This Mirror Therapy workshop successfully left a huge imprint for future MT education in south-east Europe.